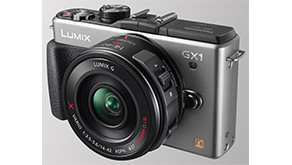 The LUMIX GX1, the newest addition to Panasonic�s LUMIX G range, lets you take your photography to the next level in an interchangeable lens camera small enough to fit in your jacket pocket. With a chic style, exceptional image quality and intuitive features that help you get the perfect shot every time, the LUMIX GX1 is designed to be your companion for all of life�s precious moments. Available in Gunmetal Grey and Raven Black, the LUMIX GX1�s elegant design is evocative of a quintessentially classic camera. Easy to handle, weighing just 413 grammes and sporting a sturdy but sleek aluminium chassis, you can rely on the LUMIX GX1 for quality photography wherever you are. Panasonic�s range of LUMIX G micro system cameras provide the perfect option if you�re looking to improve the quality of your photography without having to use a large, complicated and heavy DSLR camera. The LUMIX GX1�s 16.0-megapixel image sensor is far larger than those found in point-and shoot cameras, while the intuitive automatic shooting modes, including touch Auto Focus (AF), and the full range of advanced features mean you can easily capture your world as you see it. For exceptional photography on the go, speed is of the essence. A high-speed and extremely precise AF lets you capture all moments you want to remember without missing a thing. At 0.09 seconds, the GX1 has the fastest AF speed among Compact System Cameras(1), while the Burst Shooting speed of up to 20 Frames per Second means you can get the perfect shot of even a fast-moving object. Panasonic�s LUMIX G range is available with the world�s widest line-up of dedicated Compact System Camera lenses to choose from with 14 interchangeable lenses, making sure that with the LUMIX GX1 you have the set-up to capture every moment. These include Panasonic�s new pancake lens sized 14-42mm X Zoom lens, part of it new range of ultra-compact electronic power zoom �X� lenses, which makes the perfect fit for high quality photography in your pocket. Exceptional image quality:With a 16.0-megapixel Live MOS Four Thirds Sensor and the high-end image processor Venus Engine, the LUMIX GX1 provides the exceptional image quality and low-light sensitivity at up to ISO 12800. Stylish, ultra-compact and lightweight: With a unique luxurious design, the LUMIX GX1 is designed to become part of your everyday style, whilst being lightweight and small enough to your companion wherever you go. Assisting your creativity: Behind the beautifully classic chassis, the LUMIX GX1 hides the simple, intuitive controls and advanced functions to help you get more from your photography. The camera puts you in control, allowing you to assign your own settings to the two external buttons and two menus in the software tab for quick and easy use. With pinpoint AF in just 0.09 seconds, the GX1 lets you take perfect photography on the go with ease. AF modes include multiple-area AF, Face Detection, and AF Tracking, which allows the LUMIX GX1 to lock onto any subject and keep it in focus even if it moves. Meanwhile the integrated flash will let you take the perfect shots, whatever the light level. You can even take 3D photos with the special digital interchangeable lens that makes 3D photo shooting possible. The control to help make the most of every shot: The LUMIX GX1�s intuitive touch screen lets you have full control over your photos. Focus and defocus can be set immediately to the subject or to the background, with just one touch of the large LCD screen, while Panasonic�s Intelligent Auto Plus (iA+) functions let you take professional-level shots, even if you�re a beginner or need to shoot at a moment�s notice. Capture your memories with Full HD Movie capability: The quality advances of the LUMIX GX1 are not restricted to still photos. The 16.0-megapixel sensor means the camera can record in Full HD AVCHD 1920 x 1080, 50i, with stereo sound, producing professional movie quality with minimal noise. With long recording times, instant access controls, an advanced AF system and LUMIX G lenses specifically designed for movie shooting, the LUMIX GX1 will allow you to capture the perfect movies with ease. The AVCHD format also provides the best in both compression efficiency and compatibility with AV equipment for viewing.